Besides this, we are also going to define a couple of getter and setter methods within this class to set the above mentioned properties of MarathonRunner class. Besides these getter and setter methods, we are going to define two more methods i.e. marathonBegins() and marathonEnds(), which are going to become our joinpoints. Before the execution of these methods(joinpoints), we are going to apply the pointcuts and advices of AspectJ (using AspectJ Annotations in another Java class), later on. @Aspect - This annotation is used to specify an aspect java class. @Pointcut- This annotation is used to specify a pointcut using an expression. @Before - This annotation is used to specify a before advice. @AfterReturning - This annotation is used to specify an after-returning advice. Reads XML to create the MarathonRunner bean named MarathonRunnerBean and initiate its property name and age with a value by calling its setter methods i.e. setName() and setAge(). Using MarathonRunnerBean, the methods of MarathonRunner class are called i.e. getName(), getAge(), marathonBegins() and marathonEnds(). In this file, we have configured a MarathonRunner bean with a unique id and with its property named name and age. This properties will be assigned a value by the Spring Container using their respective setter methods, when the MarathonRunner bean is created by it using the configuration xml file. The property child element in <bean> tag refers to a property within the MarathonRunner class. The name child attribute refers to the name of a property in the MarathonRunner class i.e. name and age. The value child attribute refers to the value assigned to a specific property. The JAR associated with the AspectJ and to use its Annotations. These JARs are required in order to successfully execute this Spring project as we are working with both Spring Framework and AspectJ using AspectJ Annotations. Next, we are going to add a JAR file named aspectjweaver to the build path of our Java project. This JAR make the AspectJ work weaves or integrate our Spring project with using AspectJ Annotations. This JAR file is included in the folder named lib(within our AspectJ installation folder). So, we need to add all this JAR to the build path of our Java project as well. Project Folder - SpringWithAspectJByAnnotation is the name of our Project and it is a top-level directory. A POJO class named MarathonRunner.java. Another POJO class named MarathonTimeTracker.java class. Finally, after executing the Utility class, you will get the following output within the Console window. This output shown below, shows how the Utility class has used the ApplicationContext container of Spring Framework to load the configuration xml file - config.beans.xml, in order to access the beans specified in it, instantiate the MarathonRunner class and applying the aspects through advices i.e. @Before, @AfterReturning defined in MarathonTimeTracker. These advices defined in MarathonTimeTracker are called and executed before executing the associated method of MarathonRunner class using AspectJ Annotations with Spring Framework. 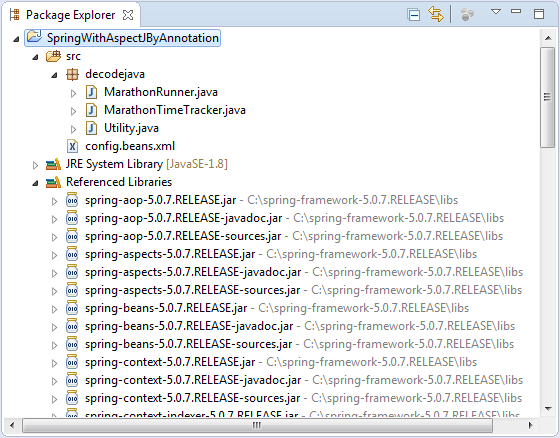 And, this concludes configuring Spring Framework with AspectJ using AspectJ Annotations.